Hope your Christmas celebration was wonderful. Sometimes just surrounding ourselves with family is the best gift of all. I wanted to show you something I got from a dear friend for Christmas and also share with you a little project I did to start the new year off. 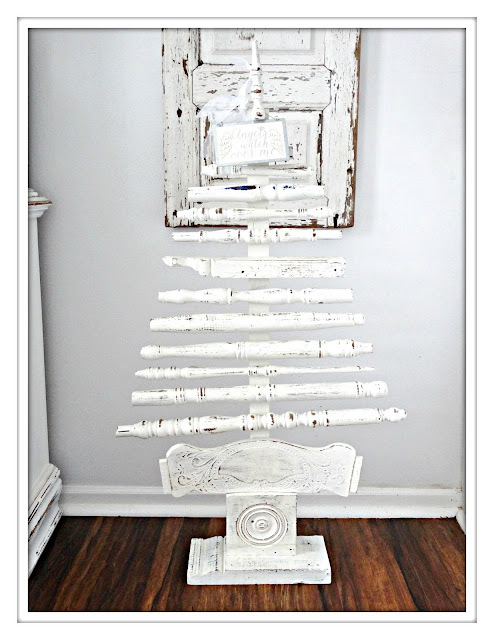 This sweet tree made of old chair parts and spindles was gifted to me by a dear friend. Oh how I love the chippiness and history to this piece. Yep! those chippy vintage spindles just make me smile. Love the old chair back and moldings for the base. Sharing My First Small Project For 2017! This was my dishwasher before Picture. 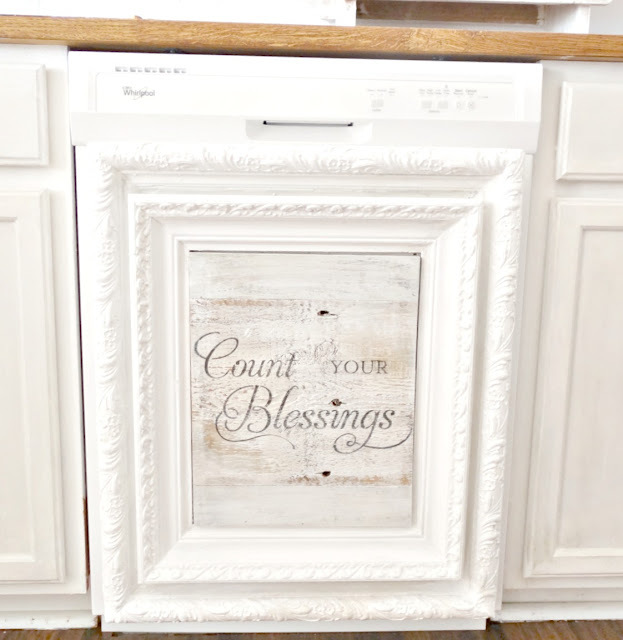 If you remember back in October I used these old frames and count your blessings sign into a cover for the front of my dishwasher. I loved the look but after a few months of having that heaviness on the door as you opened it each time became encumbering. So I wanted to change that. So back to the drawing board!!!! 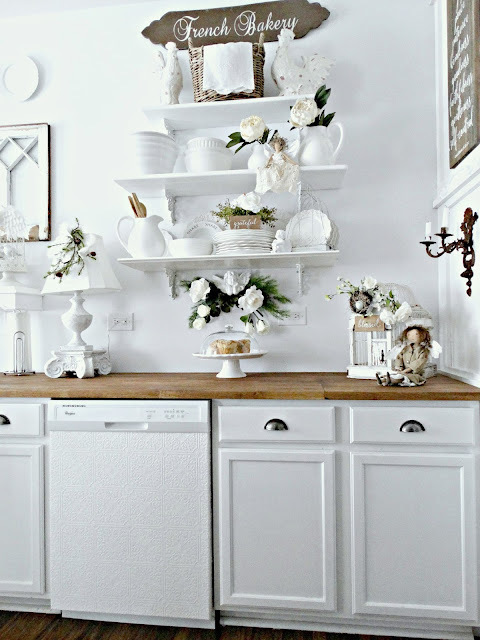 I put my creative thinking cap on and came up with a very inexpensive plan to give this door a little pizazz and not be so boring next to the white cabinets. I had Terry take the door front off the dishwasher. That was pretty easy. Just unscrewing the screws that held it on. Easy Peasy! 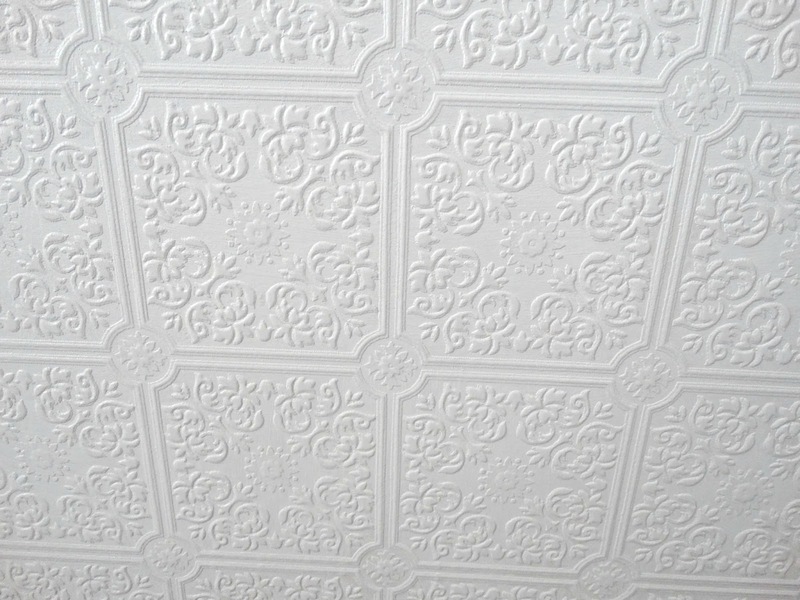 Then I measured and cute a piece of this embossed paintable wallpaper I had from another project. Took some spray adhesive and smoothed the piece onto the metal door front. Wrapped it like a package around the sides and corners. Just a very easy peasy and very inexpensive way to bling up the dishwasher front. This is paintable wallpaper so you can paint it any color you would like. So all you color lovers this would look great with a pretty color of paint on it. I of course loving my whites kept it white!!!! No shocking news there!!!! Terry did put one coat of white on this even though it was already white just to seal it for cleaning and up keep. I found the wallpaper at Menards and have seen these different design paintable wallpapers at Lowes too. In fact Lowes has these on clearance by us. So you might check out your Lowes and see if you can get a roll of this at a great price. I love this paper for doing projects since it is paintable. Even with using spray adhesive to have it stick well to the door front it is strippable. So if you change your mind like I do this can easily be removed. Wishing you health, happiness and lots of creative activities in the new year. I really like this! And I can do it myself to the dishwasher I've never used. That spindle tree is so sweet! 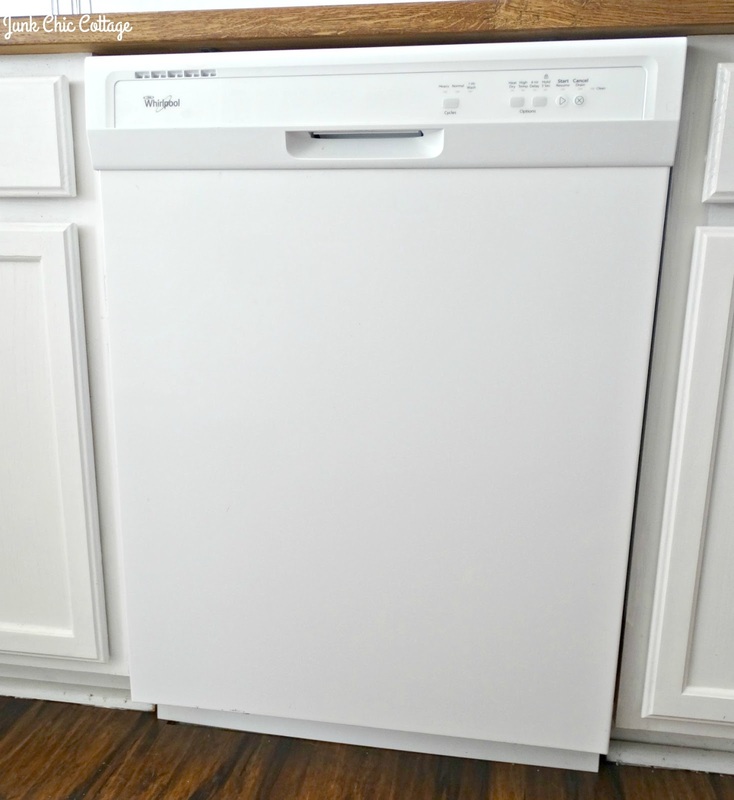 Love the change to the dishwasher, what a great idea! Kris, I like your spindle tree too-how unique! I definitely want to try the dishwasher door redo. Thanks for showing how easy it was done! But that little spindle tree, OHMYGOÔDNESS! How cute is that?! That's a lovely idea! and it looks beautiful too! Looks fantastic! Happy new Year! I was waiting fo this! I love that wallpaper and it's a perfect use for a quick change up. That door must feel as light as a feather now. I've still got another 4 days before our Christmas and you're already into new projects! Your transformed dishwasher has so much more character now. 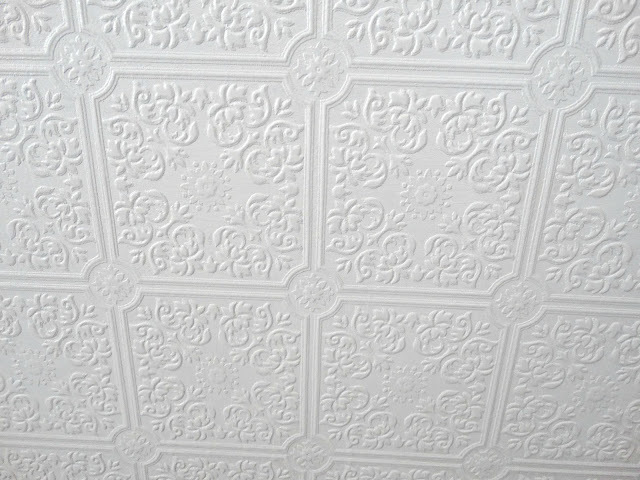 I love the look of the embossed wallpaper- it's got a vintage tin ceiling look to it. That chippy spindle tree is so perfect for you and it fits just right in the spot you've got it displayed! I hope you had a wonderful Christmas, Kris! Kris Your friend knows you well and gifted you with a stellar Christmas tree you will enjoy year after year. Chippy architectural salvage- oh yes the perfect gift. I love your new update to the dishwasher door. Textural and interesting it's a win win. That is a great idea, Kris...and good for renters, too! Love your pretty little tree! Happy New Year to you, Kris! That is so cleaver!!! I hope to start painting in the new year. I am thinking about my dining area to match the living room, so an light gray is in order. I love your ideas and appreciate you sharing them with us. You always have the most creative ideas, Kris. Too bad I didn't know about this before I replaced my bisque fridge. I could've purchased a cheap white one and wallpapered the doors! :) Hope you had a Merry Christmas!! AMAZING!!!!!!!!!!!!! You and Terry are quite the team, like Ruben and myself! 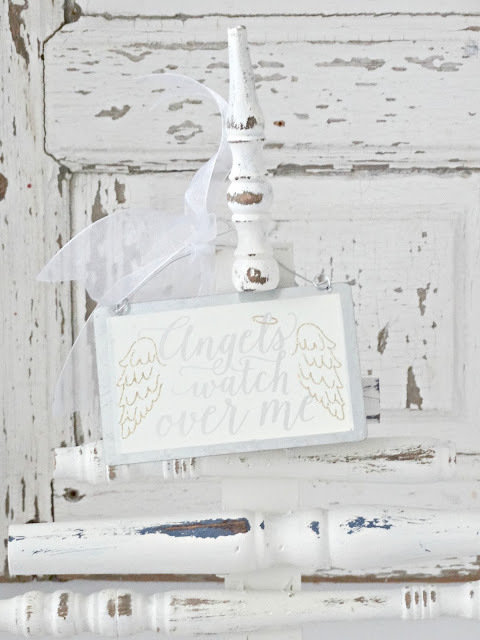 What an easy project but with HUGE results! Love it. And I wish you more creativity and health and goodness in 2017 my friend! Love that chippy tree your dear friend gave you! Great idea for the front of your dishwasher. I'm looking forward to seeing what other projects you come up with this year. :-) You inspire me. Enjoy these last few days of 2016 and may 2017 be a wonderful year for you and Terry. I love that tree made from old chair parts. 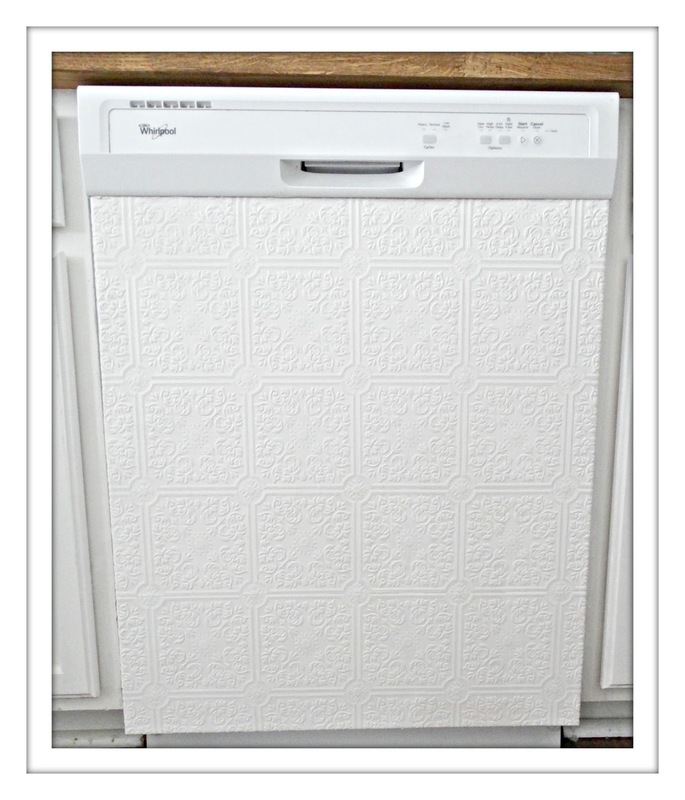 So darn clever, and so is your creative idea of using embossed wallpaper to cover your dishwasher!!! I like your tree. It is sweet and full of love. Your idea with the dishwasher is awesome. Love the idea. Adorable tree! 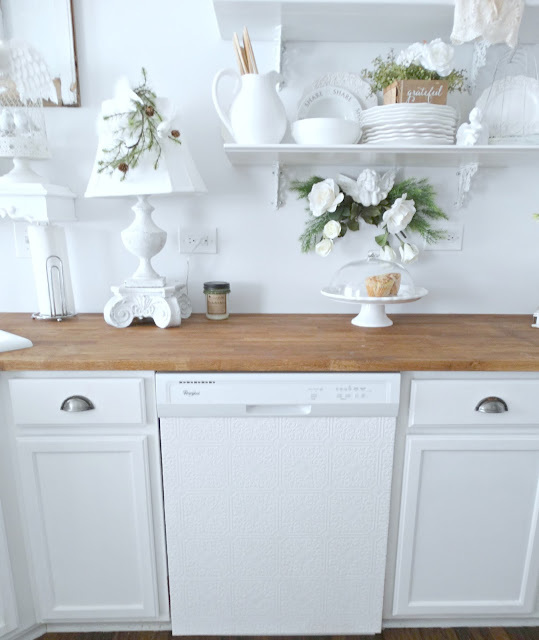 And a clever DIY of your dishwasher. Happy holidays dearie! 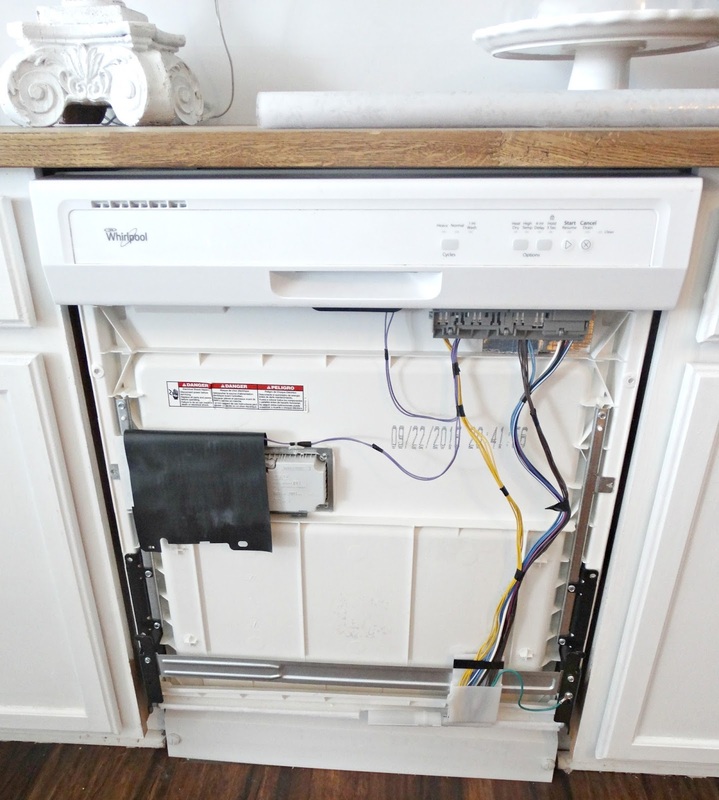 Super smart dishwasher project. And your little white chippy tree is AH-dorable! Great ideas, Kris! Love the spindle tree and the dishwasher project turned out fantastic!! I always enjoy seeing your latest projects, Kris. You had another great idea with the paintable wall paper. Your kitchen looks so pretty. xo P.S. I adore the white tree! I've pinned it in case I ever end up with old spindles and such. It would certainly solve my small Christmas tree dilemma. Soooo pretty! Looks great Kris, like it much better. So glad that you had a wonderful Christmas. Wihsing you and Terry a very Happy New Year and this year is going to be terrific for all of us. You are one of the most creative people I know. Loved the dishwasher project! Happy new year, my friend! 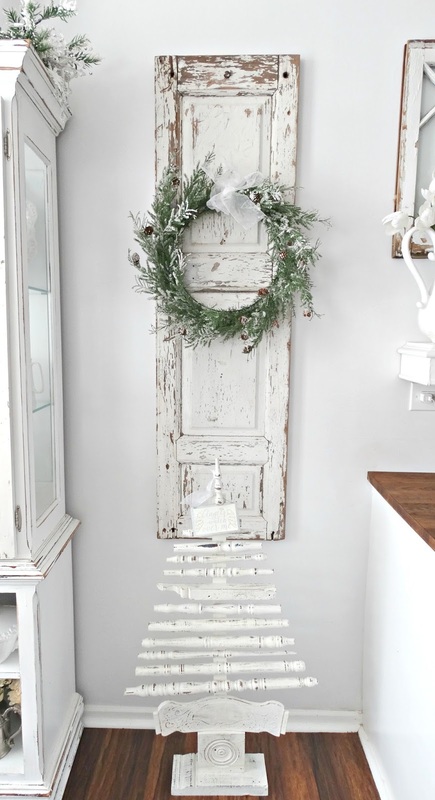 What an adorable Christmas Tree and wonderful way to salvage old chair parts. It has your name written all over it, Kris! Can you tell I'm catching up on my blog reading? That tree is simply genius! Love it. And your dishwasher project is amazing. Your ideas must never stop, love them! Genius! Only you can come up with ways to decorate the dishwasher! That tree is gorgeous too, you are lucky to be blessed with such creative friends like you! I won't ever use the textured paintable wallpaper again. I've had it on a partial wall in my dining room for a few years and it's been nothing but trouble. Maybe it's tougher than when I installed it back then. So far so good and I have run my dishwasher many times and it is holding up well. I used a spray adhesive so maybe that holds up better. Happy New Year. Thanks for your visit. Love everything! What brand of paint and what shade of white did you use? I have never seen such a cute sofa slipcover with ruffles at the bottom.Where did you get it?